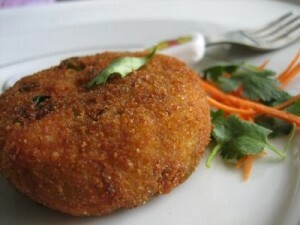 Aloo Aur Qeema Cutlet recipe by Asma at DesiRecipes.com. Fist of all boil the potatoes and mash them very finely. Now in another pan heat the oil. Now add the minced meat in it. And fry for 10 min. Now add all the spices in till and cook on the very slow fire. When it cooked propely then remove it from the flame. Now add hara dhania and podina in it. Cool it for some time then add lemon juice. Now take the boiled mashed potatoes and shape like the kabab stuff it with the prepared keema and then place another kabab on it. Make all the kababs from the material. Now in the frying pan heat the oil. First of all dip the kababs into beaten egg then into crumbs and shallow fry them until crisp golden brown. Serve it hot with chutney or raita.